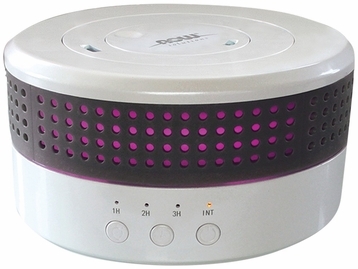 Dual Mist Ultrasonic Oil Diffuser unites aromatherapy with modern scientific innovation to create an essential oil diffuser that's the perfect complement to your home or office. This attractive diffuser is BPA-free and has dual directional mist nozzles, which utilize high-frequency ultrasonic electrical vibrations to create an ultra-fine mist. This diffusion method doesn't utilize heat, which maintains essential oil integrity and holistic properties every time you use it. Just add 250 ml (8.45 fl. oz.) of water and 5 drops of your favorite essential oils and enjoy. Just add water and a few drops of your favorite essential oil and you are set to go! Offer Aromatherapy to your clients or add that benefit to your waiting room. 2 Directional Mist Nozzles Rotate 360?